After a few moments, he leaned forward to answer a question: How does he justify the existence of his settlement in the Palestinian territories, which the United Nations believes is illegal under international law and which the United States government says is illegitimate? He said basically, ‘We’ve got the Bible. That’s our proof.’ He’s right. To see evidence of this legacy, one need only look down the road. Efrat is home to the Center for Jewish-Christian Understanding and Cooperation, an organization that regularly hosts evangelical groups and leaders from the United States. Taken at face value, conservative Christian support for Israeli settlements seems innocuous, or at the very least unsurprising — after all, the same land was Jesus’ home too. Although the Israeli government briefly halted settlement construction during the early 1990s, it has continued largely unabated ever since, and Prime Minister Benjamin Netanyahu’s administration approved the building of new houses as recently as July. Such tactics are credited with stymieing Secretary of State John Kerry’s nine-month effort to broker a peace between Israelis and Palestinians in 2014, during which Israel endorsed action on 13,851 settlement housing units in the West Bank and East Jerusalem — four times the number of previous years, according to the watchdog group Peace Now. “There are a lot of reasons for the peace effort’s failure, but people in Israel shouldn’t ignore the bitter truth — the primary sabotage came from the settlements,” an unnamed State Department official told Ynet News at the time. The chief backer of these settlements is usually the Israeli government itself, but support from foreign religious groups helps the communities survive transitional periods. While this may be beneficial for the settlements, the American religious network fueling these constructions ultimately undermines the diplomatic efforts of the U.S. government and makes the peace process more difficult. Support for Israeli settlements in the U.S. goes back decades, with many pro-settlement organizations springing to life after the signing of the Oslo Peace Accords in 1993. Groups quickly formed as American nonprofits to take advantage of tax-exempt status, accepting donations and shuttling them across the Green Line — the border between Israel and the West Bank. The legality of this practice was briefly challenged in a 1991 federal lawsuit, but the IRS did not side with those who opposed it, and the tax-exempt groups won the court case and an appeal. However, several other organizations are explicitly Christian in their language and outlook. One example is Christian Friends of Israeli Communities (CFOIC), a small but well-funded organization based in Colorado Springs, Colorado dedicated to providing “a much needed vehicle for Christians to become better informed about the Jewish communities in the heartland of Biblical Israel, to visit these areas and to provide practical support for vital community needs.” The terminology used by the CFOIC website makes their political and theological perspective clear: It does not refer to the West Bank except in quotation marks, instead using the biblical phrase “Judea and Samaria” to describe the occupied land East of the Green Line between Israel and Jordan. 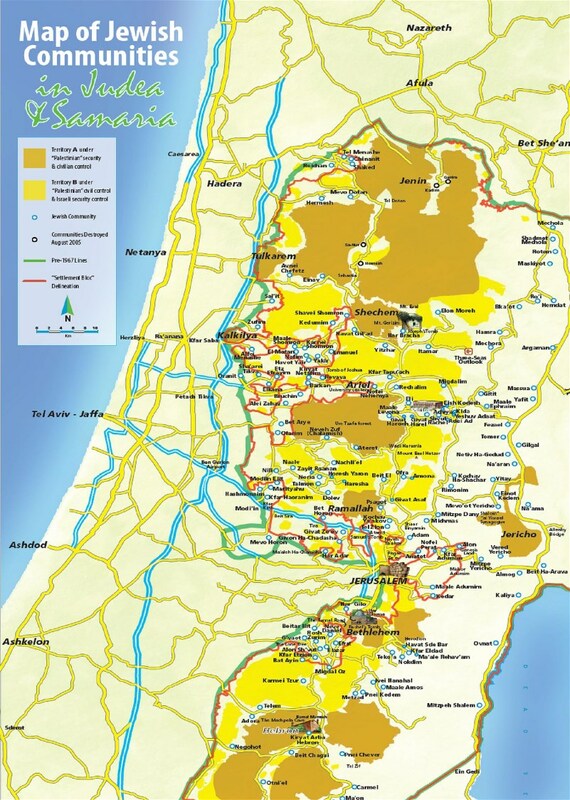 It also does not use the term “settlements,” preferring to call towns in the West Bank “Jewish communities” populated by “pioneers,” and does not appear to mention Palestinian Christian communities currently living in the occupied territories. Kim Troup, the director of CFOIC’s U.S. Office and an avowed Christian, told ThinkProgress that her group, which was found in 1995, rejects the international consensus that the West Bank is an occupied territory. Still, she noted their support primarily comes from a literal interpretation of what they say is God’s law, not humanity’s. “Our support, our friendship is offered unconditionally based on those two things,” she added. I won’t say that [the presence of extremists] would automatically preclude us [from assisting a settlement]. It is true that settlements are sometimes sites of deadly clashes between settlers and Palestinians in the West Bank — violence that has only gotten worse in recent weeks, following a rash of stabbings perpetrated by young Palestinians. But just as Palestinians are known to attack Jewish settlers, so too have settlers launched violent attacks against Palestinians. For years, settler groups such as the “Hilltop Youth” have enacted so-called “price tag” attacks on Palestinian people and homes, seeking to exact a “price” for any action taken by Palestinians — or the Israeli government — against settlements. These attacks are becoming increasingly extreme, culminating with the creation of right-wing militant groups such as The Revolt, which seeks the destruction of the Israeli government, the establishment of a Jewish kingdom, and the subjugation of the Palestinian people. Assailants affiliated with the group are blamed for burning down two historical Christian churches in Jerusalem earlier this year, as well as torching the home of a Palestinian family in July. A father, mother, and an 18-month-old infant were killed in the blaze, and vandals scrawled the word “Revenge!” under a Star of David on the charred house walls. Three months after the attack, Israeli authorities have yet to make arrests despite public statements indicating the government knows the identity of the attackers. While pressure mounts to investigate Central Fund of Israel for allegedly financing the people who perpetrate these kinds of attacks, Troup maintained the CFOIC does not in any way condone such violence. Still, she wouldn’t rule out supporting a settlement where extremists lived — even if they targeted Christians — saying their presence wouldn’t “automatically preclude” assistance. This logic has been roundly criticized by activists. The Israeli government does demolish some settlement expansions each year, but according to an extensive report released in March from Israeli human rights organization Yesh Din, many illegal outposts eventually become recognized by the Israeli government over time — often because they are touted as extensions to existing settlements. Over the course of months and years, a small outpost can accrue IDF military support (to protect Israeli citizens) and various utilities (provided by outside groups), all without the government taking action to tear it down. One such community is Derech Ha’Avot, an outpost CFOIC supported as an extension of the Elazar settlement in 2012, but which didn’t begin the authorization process with the Israeli government until 2014. Reference to Derech Ha’Avot does not appear on the project webpage, but remains in a PDF description hosted on CFOIC’s servers. The project, which was to buy playground equipment, was hardly offensive on its own, and the fundraising goal was a paltry $6,350. But advocates at organizations such as Peace Now argue that these small efforts are what help establish a community, and that it doesn’t take much money to keep a tiny village running until it is formally recognized. The key to comprehending why CFOIC and other Christian groups prop up Israeli settlements lies in their curious shared theology, particularly a school of thought known as “dispensationalism.” An old Christian theological concept with a variety of interpretations, dispensationalism’s core idea is that God promised the Jewish people the land of Israel in the Old Testament. Many dispensationalists also believe the Jewish return to the Holy Land signals the Second Coming of Jesus Christ. Darrell Bock, Senior Research Professor of New Testament Studies at Dallas Theological Seminary and published expert on dispensationalism, says the idea ultimately comes down to honoring God’s covenants. It should be a Jewish homeland and that there should be no question whatsoever on who the land belongs to. “Where there is disagreement is — alright, what is that going to look like? And how much should we be occupied or preoccupied with how that related to the return?” he added. This also appears to be the spiritual inspiration for the work of Troup and the CFOIC. “We believe that that promise and that covenant still holds true today — absolutely. That it should be a Jewish homeland and that there should be no question whatsoever on who the land belongs to,” she said. A similar theology can be found sprinkled throughout statements published by what is perhaps the most influential American Christian group funding various projects in Israel: Christians United for Israel (CUFI). Its founder, influential Texas-based pastor Rev. John Hagee, has reportedly funded various projects in Israeli settlements, an act he sees as a religious duty. “Israel exists because of a covenant God made with Abraham, Isaac and Jacob 3,500 years ago — and that covenant still stands,” Hagee told a group in Jerusalem in 2010. In addition to direct donations, this movement — a spiritual fusion of settlement support, dispensationalism, and Christian Zionism — is shored up by a broad network of American political funders and elected officials. This powerful community was once bipartisan, and support for Israel broadly — specifically its right to exist and defend itself — largely remains as such, bolstered by the efforts of groups such as The American Israel Public Affairs Committee (AIPAC), whose official stance on settlements is somewhat vague. But the hardline pro-settlement caucus is now squarely rooted (with a few exceptions) in the Republican party’s base, especially among religious conservatives. For example, a ThinkProgress investigation of IRS Form 990s uncovered a web of funders who give money to both Republican campaigns and organizations that support settlements. The Family Foundation of American billionaire and prominent GOP funder Sheldon Adelson gave $150,000 to Christians United for Israel in 2012–2013; the Christian Broadcasting Network, owned by Christian conservative and prominent Republican funder Pat Robertson, gave $15,000 to Christians United for Israel in 2006; the Pat Boone Foundation, run by famous singer and avid Mike Huckabee supporter Pat Boone, gave $3,000 to Christians United for Israel in 2007 and $500 to Christian Friends of Israeli Communities in 2008; and American Values, headed up by former GOP presidential candidate and supporter of Mitt Romney in 2012 Gary Bauer, donated $102,000 to Christians United for Israel from 2007 to 2010. These donors, in turn, tend to support likeminded political candidates. This includes former Arkansas governor and current Republican presidential candidate Mike Huckabee, who has traveled to Israel “dozens of times” over the years and who refers to the West Bank as Judea and Samaria. Huckabee actively courted Adelson’s financial endorsement by likening the Obama administration’s nuclear deal with Iran to a new holocaust, but his support for settlements is so deep that it’s reciprocal: He hosted a campaign fundraiser in the West Bank settlement of Shilo during a visit to the region in August, where he used biblical arguments to endorse Israel’s right to settle the occupied land. Fellow GOP presidential candidate and Texas Senator Ted Cruz also visited Israel this year, where he met with politicians and spoke to the Israeli Knesset, or parliament. He has generally articulated a more hands-off approach to settlements than Huckabee’s, but still de facto endorses the status quo by leaving the issue up to the Israeli government. Cruz’s statement that ‘Christians have no greater ally than Israel‘ is dispensationalist. Although Cruz hasn’t claimed to be a hardline dispensationalist, other dispensationalists have already lifted him up as one of their own. When he declared that “Christians have no greater ally than Israel” during a deeply controversial speech to Middle East Christians in October 2014, Rob McCoy, senior pastor of Godspeak Calvary told the Washington Times that Cruz was effectively speaking in religious code. And while groups such as CUFI aren’t single-issue organizations like CFOIC, Sen. Graham has highlighted the key difference between Christianity-focused bodies and other pro-Israel groups such as AIPAC. “AIPAC is bipartisan…Not so much for y’all,” Graham said at the CUFI conference, drawing laughter from the crowd. But as the issue of settlements becomes a right-wing cause, CUFI and other groups are already assembling new organizations to pressure other politicians to their uphold their views. In July, CUFI created the CUFI Action Fund, a 501(c)(4) lobbying group the Washington Post declared the “pro-Israel NRA.” CUFI Action Fund’s first mission was an unsuccessful effort to defeat the Iran deal, but time will tell whether it will mirror Hagee’s passion for West Bank settlements. In the meantime, groups such as CFOIC show no signs of ending their financial support for settlements. Troup continues to reject the notion that building cities in land international law deems occupied inhibits the Middle East peace process, arguing instead that Jewish communities bring more stability to the region. “To say that the communities and the Jews living in Judea and Samaria are the obstacles to peace…I absolutely disagree with that wholeheartedly,” she said. “Their life is better when the Jews are there. There’s jobs, there’s money… the [Palestinian] quality of life is so much better than under Arab control,” she said. “There are definitely some [Christians] on the opposite side of the spectrum, but we don’t worry about those,” she added. Josh Israel also contributed to this report.